When I started this blog, I worried about being able to do justice to this set of the Kings and Queens of England. Especially for a monarch as pivotal as Richard III. When I started inviting guest bloggers, I realized I knew only one person who could do the job - my friend, Gloriana. 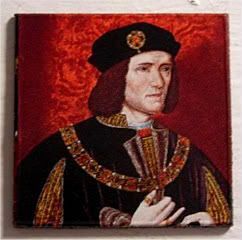 As a card-carrying member of the Richard III Society, I was overjoyed when joy asked me to guest blog on this magnet in honor of Richard III's 557th birthday. Or at least meet what we think Richard III might have looked like. Though this is the "official" portrait hanging in National Portrait Gallery and the one that adorns countless book covers (and magnets), no one's entirely sure that it's actually right. The only surviving portraits of Richard III were painted long after his death, and subsequently altered by later generations. X-rays show us that his shoulders have been thrown off-kilter to suggest a hunchback, his eyes have been narrowed, his mouth made thinner. It's the Tudor version of evil Photoshop. We're all told that history is written by the winners, and the changes to Richard's portrait would seem to be the perfect example. In the years after Lord Stanley changed sides to crown Henry Tudor at Bosworth (damn Stanley! ), the Tudors executed a smear campaign, paying off historians and painting over portraits to systematically craft an image of a dead rival deformed both in body and character. Thanks to William Shakespeare - backed by the sainted Thomas More - Richard seemed doomed to be remembered forever as the ultimate wicked uncle, a deranged, murdering hunchback screaming for a horse. Winter of discontent, indeed. That's more than three thousand people worldwide devoted to clearing a man's name 500 years after the fact. As the current Duke of Gloucester, the Society's patron, explains, "The purpose and indeed the strength of the Richard III Society derive from the belief that the truth is more powerful than lies - a faith that even after all these centuries the truth is important." Today the battle for Richard's reputation rages on. Depending on the current historical vogue and your historian of choice, Richard may be depicted as the perfect Plantagenet prince cut down tragically in battle (damn Stanley! ), an able yet ruthlessly ambitious man of his time, or the embodiment of all evil. Posthumously, Richard's been put on trial for the murder of his nephews, the fabled Princes in the Tower, multiple times in multiple settings. He's been acquitted by no less a personage than the Chief Justice of the United States. Twice. Despite these victories, the truth of Richard remains much like his portrait. Five hundred years, some expertly coordinated mud slinging, and many fervent Ricardians later, we can never really be sure what Richard even looked like, let alone the kind of man he was. The available historical sources tend to be hopelessly biased and somewhat less than credible. (Would you choose to believe a guy who thinks women can be pregnant for two years?) It's a little like someone in 2509 trying to reconstruct today's events using nothing but TMZ's twitter and three or four blogs with widely divergent viewpoints. Which means that it becomes up to the individual to decide who Richard is to them. What kind of man do you see staring out from his portrait? And how far do you think he would go for power? For my own part, I'll say only this: Damn Stanley. As a card-carrying member of the "Glor inducted me into the Richard III society and now all I need is the card" society, I say, brilliant! And SR, it's so true--you have to wonder who else has been libeled out the wazoo, just because he or she lost? And were the heroes we know of really so great, or did they just get to be called great because they won? As for Richard, I'll keep reading, and keep hoping that somehow, some way, he just doesn't lose his horse in battle this time. If I'd been writing on the anniversary of Bosworth (August 22), I probably would not have been able to resist a good Richard Armitage reference. But then if I'd included all of the Ricardian trivia bouncing around in my head, I'd have bombarded poor joy with a *cough* novel. It was a struggle getting it this (not) short. Thanks SR! I'm always happy to convert people to the cause (as others will attest). I really do recommend Daughter of Time if you're interested in learning more. It is a novel, but it does a better job of exploring the various sources than many of the true histories do. Thanks Glor for the suggestion to read the Tey novel! I have always meant to do so, but never "gotaroundtoit." I think I will make time now that you've whetted my interest. Keep up the great work, too! "He's been acquitted by no less a personage than the Chief Justice of the United States. Twice." Former Chief Justice William Rehnquist ruled in favor of Richard in two mock trials in 1996 and 1997. The first was at the Indiana University School of Law with members of the school's mock trial participating. Decision was a 2 to 1 not guilty verdict. In the second, Lawyers' Committee for the Shakespeare Theater in Washington, D.C. sponsored a mock trial before three Justices of the U.S. Supreme Court. This time it was a 3-0 decision that the prosecution had not met the necessary burden of proof. See? I *knew* gloriana would be perfect for this magnet! What a great discussion...and thanks, glor, for the mock trial info. Superinteresting. There's my Richard Armitage segue! As far as I know, there aren't any movies that adopt the "Richard: Maybe not entirely evil!" viewpoint. Richard Armitage (born on the anniversay of the battle of Bosworth and named after Richard III) has said that he is working on such a movie. But who knows if it will ever see the light of day. Please work faster, RA! Really you'd think someone would give the Plantagenets a little love, what with all the "re-telling of Arthur" and "re-telling of Robin Hood" and "re-telling of Henry VIII" shows there are out there. Get on it, BBC! The best Richard movie recommendation I have is Looking for Richard, which is a docudrama that at least breaks down some of the history behind the Shakespearean play to make it more understandable. Definitely not pro-Richard in any way, shape, or form. But it's a good intro into the basic Richard plot. Also, I think it's not totally contradictory to be pro-Henry VIII and pro-Richard III, as it was Henry VII that did the deposing and most of the executing of the remaining Plantagenets. It's like being able to like Henry V but not Henry IV or Henry VI. Besides, Richard is Henry VIII's great uncle, so it's all in the family. Kind of.